Playful Pink consists of six pairs of cotton-rich socks, all in three shades of pink: hot pink, pink and light pink. There are three solid pairs of socks and three pairs of white socks that have pink polka dots and bows woven into the ankle. These socks come in a keepsake box making them a great present to give and receive. 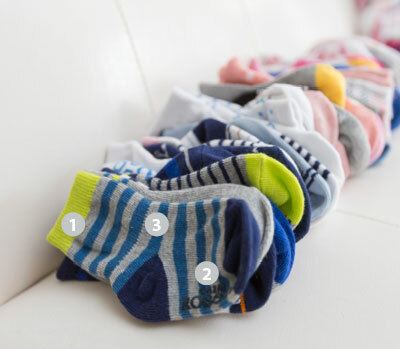 Moms love Robeez cotton-rich socks because they feature elastic gather at the ankle to ensure that they stay on and a skid resistant application on the soles to help prevent slips and falls. Robeez, the original kickproof infant sock since 21. These socks actually stay on! Bought these so that my daughter could kick her feet like crazy and still keep her feet warm. Other socks would be kicked off before she was off the change table, these ones have stayed on all day. I did order a bigger size so her feet have lots of room to grow. She’s three months old (big for her age tho), I ordered the 6-12 months and the tops of the socks go to her knees. The only socks that stay on!